Following a trial of sensors that can report when road gullies are getting blocked, a highway authority has said the technology will require further work before being widely used. In autumn 2016 engineering firm Amey installed new sensor technology into gullies in Hampshire, where it was at the time the county council’s highway maintenance contractor. The sensors measured the level of silt and the water level inside the gully, feeding this information back to a control centre managed by Amey via web-based, mapped, visualisation software. It was said that technology worked well, gullies would only need to be cleansed when they are at risk of flooding, leading to 'a radically different approach' to gully cleansing. However, both parties have presented the trial as something from which they have learned, rather than an outright success for the new technology. A Hampshire CC spokesperson told Highways: ‘The County Council is always open to new ideas to help us make the most of the resources we have to look after Hampshire’s roads, such as potential ways to improve our response to adverse weather and flooding. 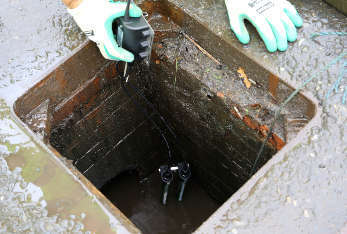 ‘We looked into a trial of gully sensors which offered the possibility of helping us quickly resolve some types of flooding on the roads, by alerting us to blocked gullies; and also to provide data on key factors which affect flooding on the roads, such as silt and water levels in the gullies so we could proactively prevent flooding. David Ogden, Amey’s business director for highways, said: ‘Following the results of the pilot, we calculated that we have the potential to reduce the cost of gully cleaning by 20%. This was through better knowledge of the gullies but also by developing an on-demand approach and real-time monitoring. The May issue of Highways magazine will contain a feature on the use of ‘smart’ gully technology, covering gully sensors, asset management software and the importance of using information from sensors as part of the bigger picture. A year on from joining the Buy Social Corporate Challenge, Amey has announced that it spent almost £1m with social enterprises in 2017. The Challenge is an initiative run by Social Enterprise UK that sees companies open up their supply chains to social enterprises, businesses which trade to meet a social or environmental mission. In 2017, Amey spent £930,000 with social enterprises, following extensive work with Social Enterprise UK to identify new organisations for Amey to work with. It said work is now under way to secure an even greater spend for 2018.